OMG!! They’re alive!! And OK, Really!! I hope none of you were worried – just an extended case of the retired lazies. No other way to put it. The summer heat in Mexico was not conducive to the much more active approach we had from fall to spring. So here we are, and it’s almost Christmas – better do some catching up before everyone loses interest. When last heard from, your intrepid travelers were finishing preparations to depart for points north of Guaymas, destination unknown. We had a vague plan to get Larry back to the SF area by mid-September in order to help his buddy Joel finish his boat prep and bring his (Joel’s) boat to San Diego for the 2010 Baja HaHa. We also had a vague idea that there might be some small amount of paid work for Muggs if she returned around the end of August. We traveled north for about two weeks with Aquadesiac. I don’t have the log book to refer to, nor the cruising guide, so I don’t remember the names of any of the places we went. I do recall that we spent several days in a large bay northwest of San Carlos, just outside Marina Real. 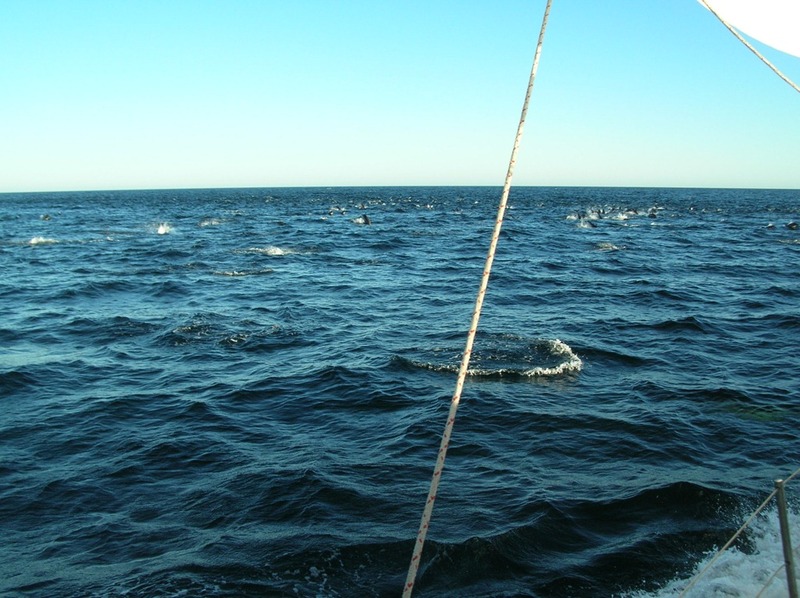 Boats don’t stay there because there is no protection from the typical northerly and westerly winds and waves. The weather was very quiet, though, so the lack of protection was no problem. This spot is very near to the Soggy Peso where we watched waves big enough for body surfing a couple of weeks ago! There was some good snorkeling and another cruisers’ potluck on the beach. One night we experienced a chubasco while at anchor. A chubasco is a typical nighttime summer weather event with lots of wind and lots of rain. It came on fairly quickly, and we were not prepared. It was so hot that we had unzipped the forward windshield portion of the dodger and removed most of the other screen side panels of the cockpit enclosure. We were sitting in the cockpit when the rain started – actually, we had hail first, as I recall – and we immediately decided that the entire enclosure needed to go back up. By the time we got ourselves organized and started trying to zip the windshield back in, it was hailing, pouring rain, and very windy. Larry was on deck tackling the zipper from one side; I was in the cockpit trying to help from the other side. It seemed to take an eternity, but eventually we got it done. The chubasco was over in less than an hour. 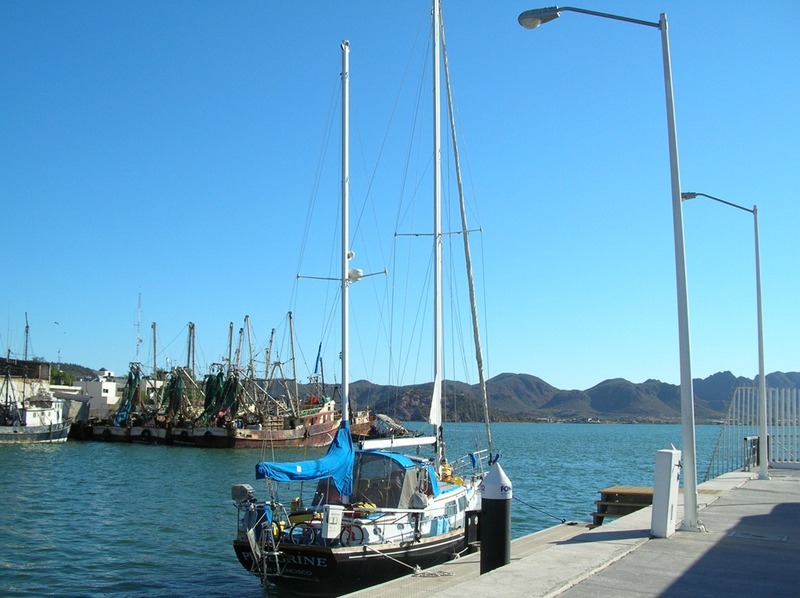 Soon after that, we started thinking about getting me headed back south in order to get to a city (Guaymas) large enough to be on a major bus route. The plan had been for Larry to single-hand the boat alongside Aquadesiac to Santa Rosalia where he could catch a bus a couple of weeks later. I asked a boat in our anchorage that was headed back to Guaymas if I could tag along for the short trip back. This was my unlucky day, I guess, because the couple we asked (at the suggestion of two other boats that were going the other way) became very pissed off at us, lecturing and scolding and all the rest of the unnecessary bluster that I’ve come to expect only in the US. It shocked us to run into it here – after all, it was only necessary to say, “Sorry, no.” Certainly, it wasn’t presumptuous of us – this kind of thing is done all the time on boats. Larry and I have done it (taken in an unvetted stranger) for a few days at the dock. In fact, the idea of asking for a ride hadn’t even occurred to me until it was suggested by other boats in the anchorage. 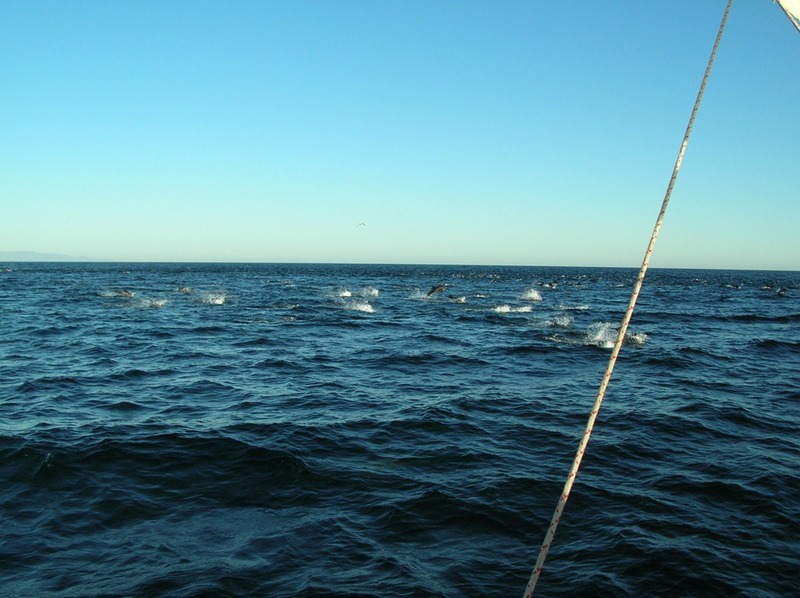 These other boats, with the one exception, were all headed north, as we had been. I remember afterwards that Larry was so mad, he scribbled an entry about it in the log book and then wrote, “Sorry, Elizabeth. These @#*holes were from Australia! !” Which was true, but doesn’t explain or excuse their behavior. Anyway, enough of that. It all turned out for the best. After spending a few days in the very nice (and expensive) marina in San Carlos, I finally convinced Larry that he should come back with me now – not later. 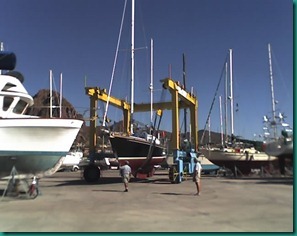 We took the boat back to Guaymas where she could be stored relatively inexpensively on the hard. When we truly faced the huge task ahead to get the boat ready to leave behind in the hot weather (and potential hurricanes), we both realized that we would be lucky to get it done in a week. 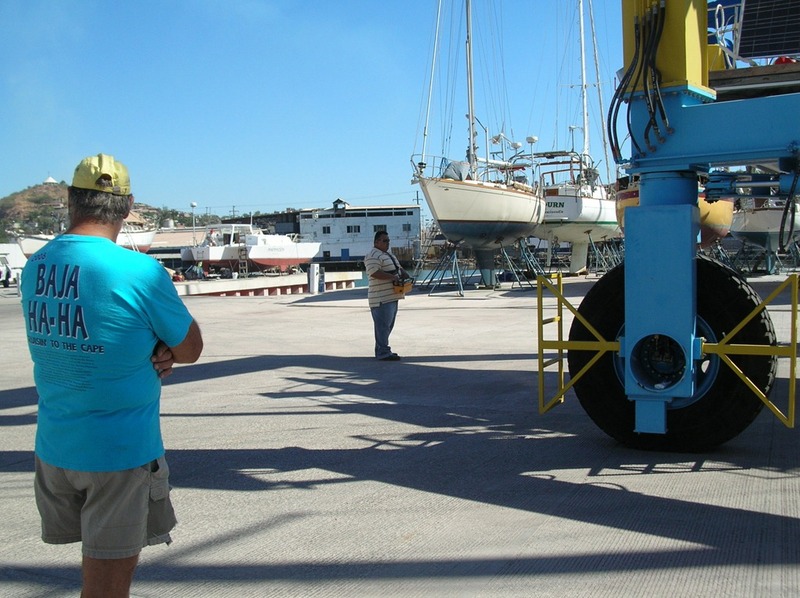 Prepping a boat for storage in hurricane season is a huge task. We ended up removing every bit of canvas (sails, dodger) from the deck plus all the other gear usually stored on deck – dinghy, liferaft, bicycles, etc. – and stowing this stuff somewhere inside. That all had to happen AFTER we went through the cupboards and got rid of any food that could suffer from an excess of unventilated heat. And while you’re doing this, you still need to maintain access to the bed in order to get to sleep each night. I rode the bus back to Stockton a week before Larry. He finished the heavy lifting and followed me the following week. 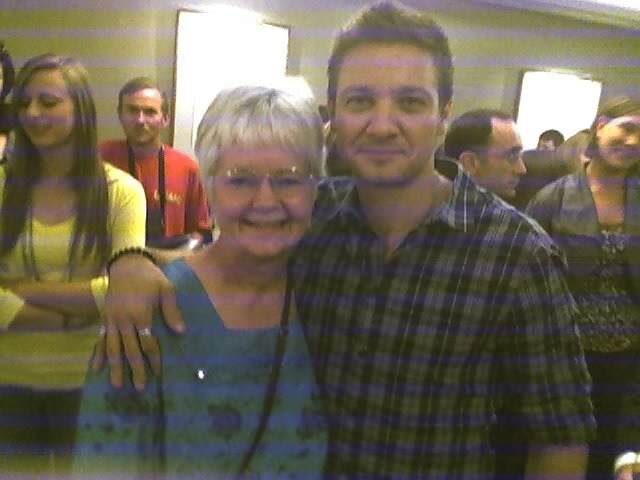 And just today I read that he has been nominated for a Golden Globe award for his work in “The Town”. Congratulations and good luck, Jeremy!! 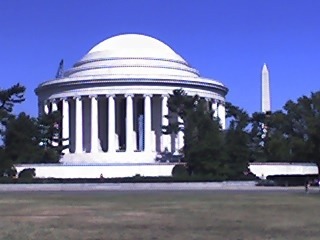 The Washington trips were wonderful. 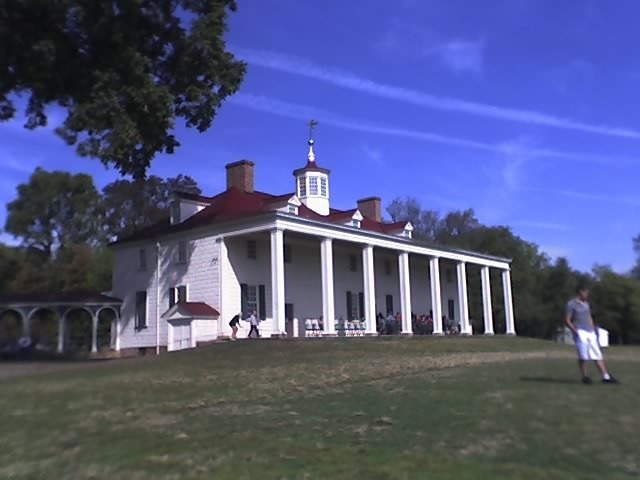 The two trips were similar: I spent three nights in an expensive business-class hotel in Alexandria; each of those three days I participated in test-question writing workshops; I spent four nights in the apartment of a local woman who rents her room over the internet to strangers; and I spent my extra days immersing myself in the wonderfulness of DC historical sights and museums. After the organization I was working for reimbursed my major expenses, these trips did not cost very much – the room was $40 per night. AirBnB is the website. I think they have apartment and room listings in rooms all over the country. 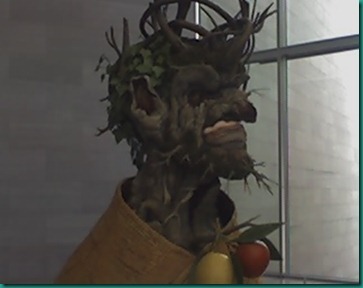 This sculpture was done by a modern artist but based entirely on the paintings of Arcimboldo, a 16th century Italian painter. Arcimboldo painted more than one series of four paintings of each season represented as a head with all details derived from images of varying scale of fruits, vegetables and other plant matter. The plant material was all chosen to be season-specific. 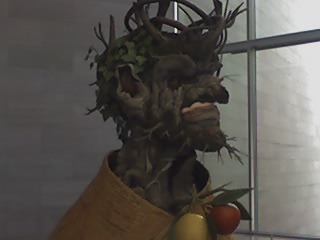 Please Google “Arcimboldo” to see what I am talking about. This artist’s skill is breathtaking. She used all my favorite colors! After dinner, Craig took us all for a drive thru the mall area to see the monuments at night. Everything was, of course, spectacular. Clara and the children were in the back seat playing games as we drove – name a state! name a president! 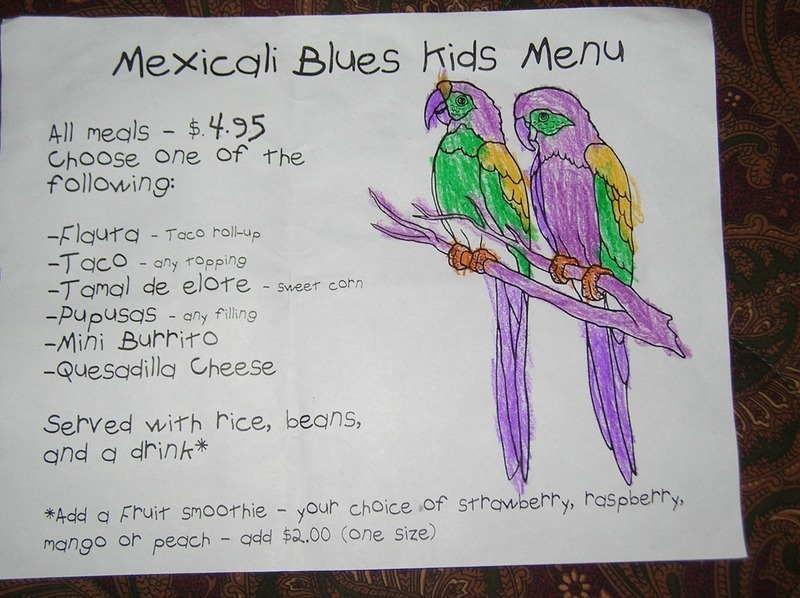 These kids are 4 and 6! This evening was lots of fun and impressive. Actually, I think every word is worth a red highlight. 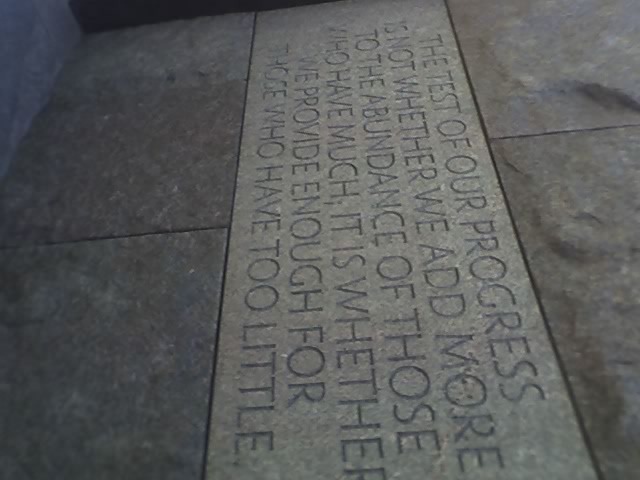 Whoddathunk – realizing that knowledge would grow and times would change! 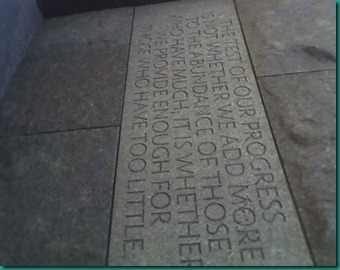 Another inspiring idea, this from a wealthy Roosevelt! 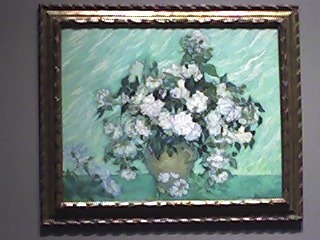 This painting was one of the last painted by Van Gogh. 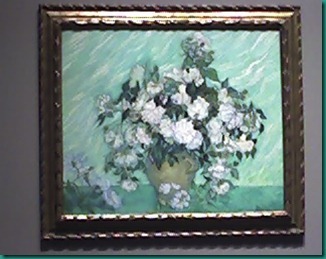 It is part of the exhibit in the National Gallery of Art, West Wing. Van Gogh has been a favorite of mine for a long time along with his French contemporaries Monet and Renoir. I clicked this picture before being told not to by a guard. The museums have varying rules about picture-taking. The rules can vary from exhibit to exhibit within the same museum. I honestly didn’t know – I had checked for signs which I somehow missed seeing. “Luncheon of the Boating Party” by Renoir is the centerpiece of a beautiful small mansion museum, the Phillips Collection. I stayed there all day and enjoyed an amazing piano recital by a very talented Spanish pianist, Daniel del Pino. HIGH SCHOOL REUNION AND RETURN TO MEXICO – THE GIANTS WIN THE WORLD SERIES!!!!!!!!!!! 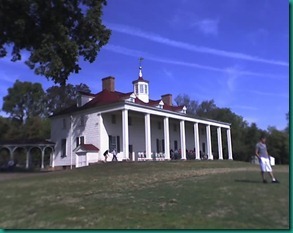 I returned from Washington the second time on the day of my 40th high school reunion. That was lots of fun! I learned that there are actually two or three people following us on this website that I haven’t talked to in 40 years! That is very cool. Later in October, we attended a Sock Hop at the Oakland Yacht Club. I walked a 5k Bridge to Bridge with Jim Golden and his sister. Larry came along just for laughs, and by the end of the day I think he had walked as much as anyone else. The webmaster, Patrick, invited us to share the hospitality of himself and his wife, Valerie, more than once. They have become enthusiastic foodies, and eating at their place is always terrific! 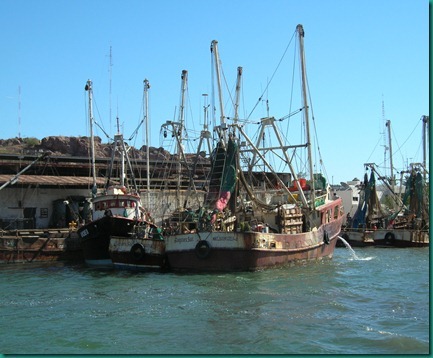 Eventually, it was time to return to Guaymas. 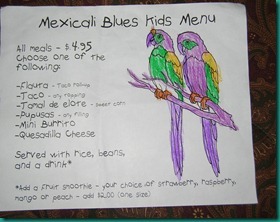 We had made arrangements to help our friends, Kathy and Robert of Blue Dolphin, drive their truck back to Mexico. We loaded it up pretty full – there are two bikes on the roof, and it’s not easy to close that rear window! We stopped along the way in San Diego where we visited their beautiful yacht club on Coronado Island and relaxed in the club’s hot tub. In San Diego we watched the Giants lose the only game that they lost in the World Series. We watched them win the next game while staying at a lovely hostel in Tucson. Then we watched them win it all at a gringo sportsbar in San Carlos after arriving without incident in Mexico that morning. We became fairly rabid fans for just fair weather fans – we watched every game of the playoffs with Larry’s mom who seemed to enjoy it as much as we did. 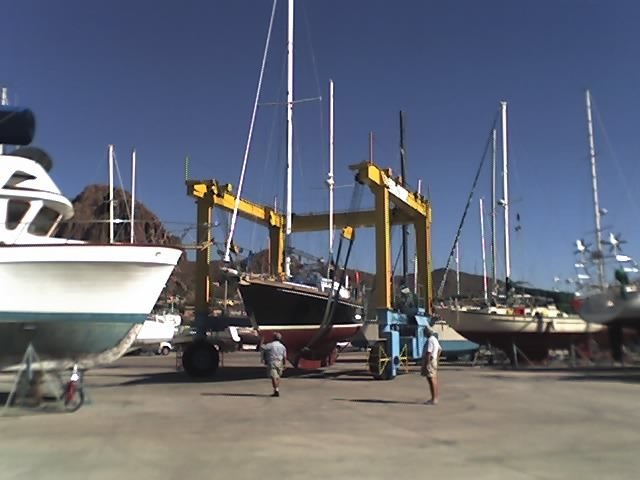 After arriving in Guaymas, both cruising couples were faced with the daunting task of re-commissioning their boats for cruising. The job was big enough for us, but it was absolutely huge for Kathy and Robert – a beehive had been built and was thriving inside their main mast! Yikes!! They tried many, many things to get rid of the bees. One of the moderately effective efforts involved a hose connected from the exhaust of their gas-driven generator. A vacuum cleaner was always close at hand for cleaning up the dead ones. There was a couple staying near our marina that had a pair of small dogs that looked like mastiffs (I think – I’m not real knowledgeable about dog breeds). Anyway, darling, sweet dogs, but one of them had become very sick during the week before we arrived. 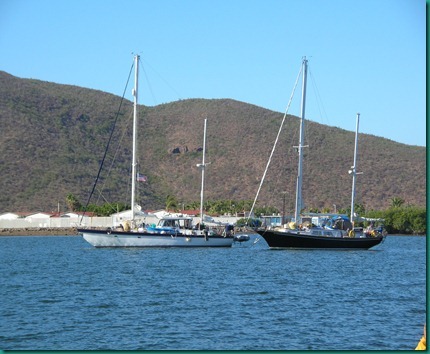 Doug and Linda of Aquadesiac had already returned to Guaymas after spending their late summer in the Bahia de Los Angeles area. 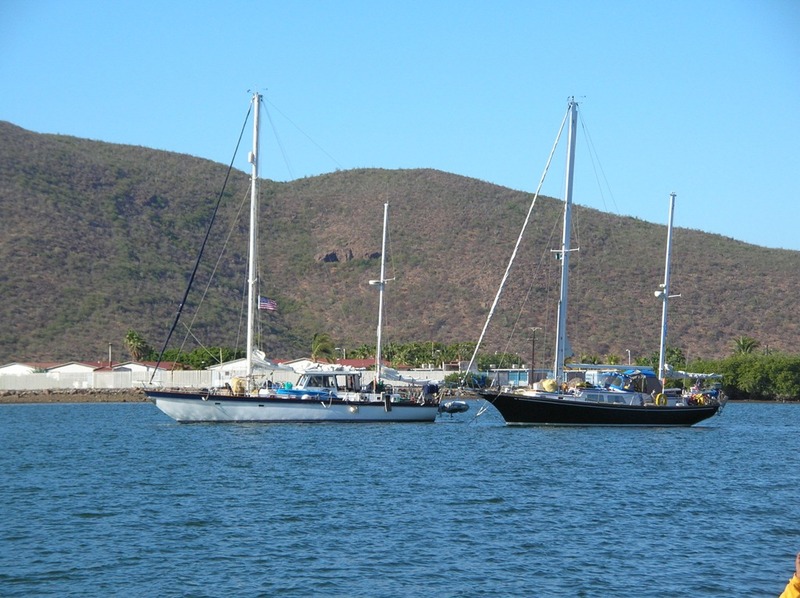 Linda tells us that this couple found a great veterinarian located in San Carlos – 14 miles away – who came out to their boat in Guaymas harbor at anchor! I think Linda took him from the dock to the boat by dinghy in order for him to get to the dog. By the time we arrived, the dog was walking around but still very sick. However, a day or so after that, he was his old self again! It was easy to tell the dog’s progress because the pair was always together, and the other dog didn’t get sick. Great veterinary care, and boat calls, too! I believe this is a 50-ton travelift. These pictures don’t do a very good job of showing what I want to illustrate – the operator is not located in or on the travelift. Horacio is the man in the center of the picture below. He has a driving console slung over his shoulder like a guitar and is operating every aspect of the lift by remote control. He was pretty good at this, too. During November, the yard is very busy. 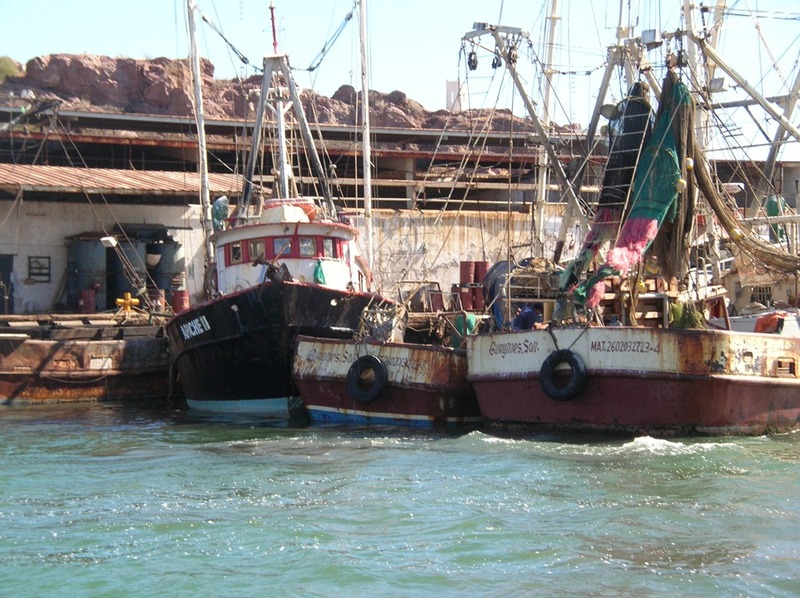 Since it is also small, Horacio often has to relocate boats in order to get to other boats. It would not be unheard of for a boat to be moved more than once in a day or several times in a week. 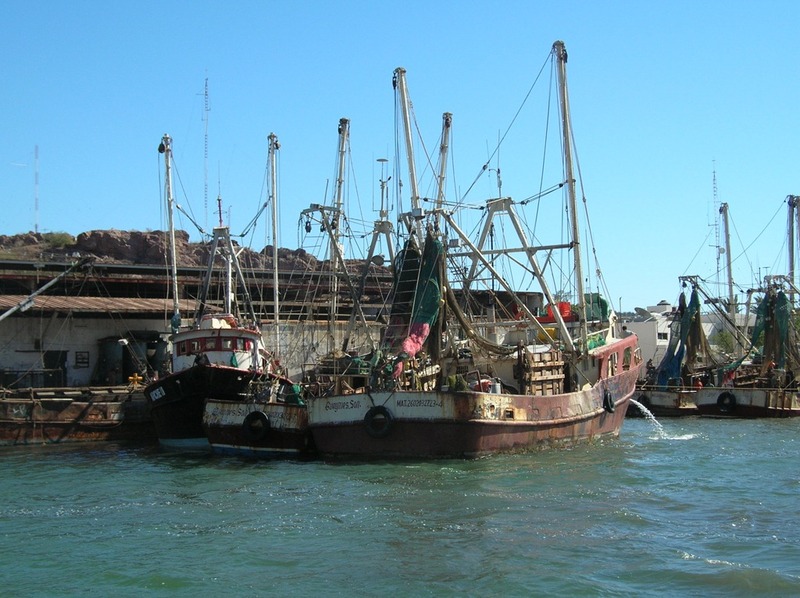 At least one couple we talked to had deliberately requested to be located at the far back of the yard where they would not be in the way of any hauling and launching operations. Our boat was moved once before being splashed. At the gas dock, here you see everything looking fairly ship shape and ready to go, but it took a lot of work. We had taken all of the dodger canvas to the local seamstress to get it restitched. She did this huge job for $40! Getting it back on the dodger frame was a pretty special challenge which involved unprintable language and strained muscles. Sometime during this period, a young man, about 22 years old, approached Linda and Doug and asked if they would like to have crew. Linda immediately snagged him – he is cute, he speaks French, Spanish, and English, he is experienced on sailboats, and he COOKS!! After Leo arrived, no one on Peregrine or Aquadesiac did any serious cooking for dinner. Plus, he cleans up, too. We left the gas dock soon after and anchored out in front of this marina for about three days. During that time, Larry and Doug from Aquadesiac had to troubleshoot — including a trial replacement that didn’t work — our alternator. Eventually, they had it fixed, or so they thought. Everyone else was ready to go, so we headed out for Mazatlan by way of Topolobampo about a week before Thanksgiving. Along the way, Larry realized that the alternator still was not working correctly so he gave it one good long, last look. This time he figured out the mistake that had been made in some rewiring, corrected it, and voila! Fixed! Another miracle at sea! 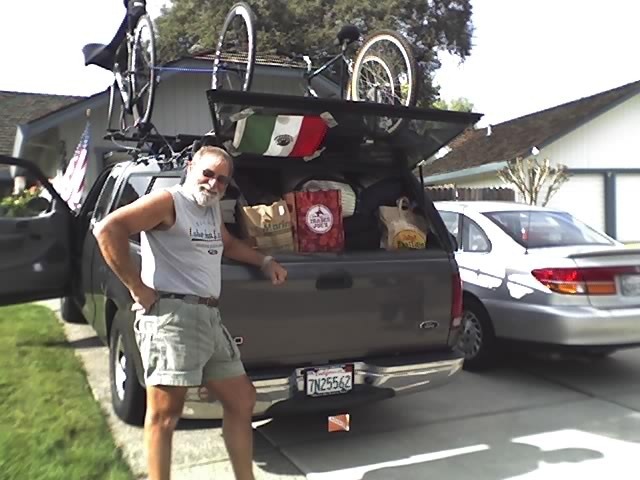 We continued on and arrived at an estuary and bay area called Topolobampo. Just in case you’re wondering, this is an indigenous word, not Spanish. “Topolo” means turtle and “bampo” means water. We didn’t see any sea turtles here, though. 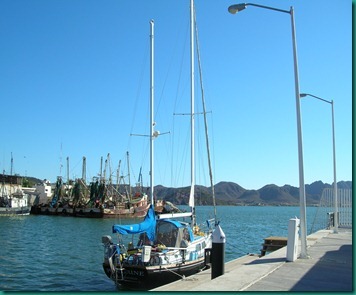 Topolobampo is an active ferry terminal. The ferries arrive around 10pm which is approximately the time we arrived – what timing! 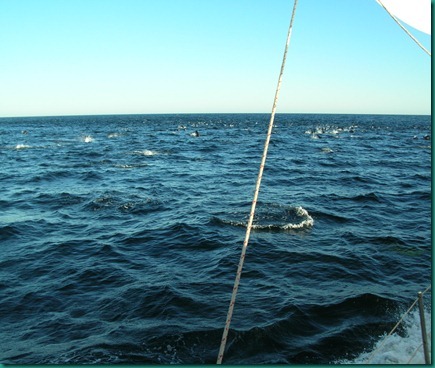 We were actually in the area offshore before sunset, but the area is huge and not well marked. Eventually we found lighted channel markers (red-right-return!) and headed in. I suggested that we pull out of the channel before we got very far and anchor for the night in a small cove near the harbor opening. This would leave the serious navigating challenge for the daylight the next day. 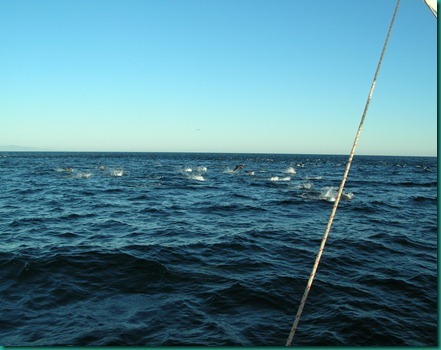 Everybody agreed that this was a good idea, so we proceeded onward, counting channel markers to locate the cove. We got about halfway in when we had to “pull over” to the right to make way for a ferry which was arriving at full throttle (the ferry dock is another mile or two inland). Aquadesiac pulled over a little too far – they were in the lead – and went aground! Blue Dolphin and Peregrine pulled back into the channel while Aquadesiac, fortunately, powered themselves off the mud. Then Blue Dolphin took the lead taking us into the cove for the night, but before we were all settled they beached the Dolphin! They were able to power off fairly quickly, and soon we were all anchored and snug for the night. Kathy says she will never forget the sight of looking just over her bow and seeing the beach!! You can also see green growth in the background – these are mangroves which are breeding grounds for mosquitoes. Our two boats were far enough away to not be bothered, but Aquadesiac was not as lucky. The first evening, Linda thinks she had over a hundred mosquitoes in her boat. She radioed to us about them, and we put out a repellent burn stick. No one else had a problem with them, so we figure it must have been their location that made the difference. Pancho, the jet ski guy, brought pastries over the day after our arrival and invited us to a restaurant nearby that did amazing fish cookery. The next night, nine of us (I think) crammed into his Jeep Cherokee and went to this place about 20 minutes away. And the fish was amazing! Larry ate at least his fair share, too. First crab legs, then shrimp, then a whole fish broiled with a wonderful sauce. All for about $12 apiece. On the Monday morning before Thanksgiving, we received a phone call from Larry’s cousin Shelly. She had received a call from Larry’s mom (Jeane) who was in distress – she couldn’t breathe. Shelly told her to push her Lifeline call button which she did. Unfortunately, this also disconnected her from Shelly without warning. Now Shelly wasn’t sure what was going on, so she called an ambulance, too. Anyway, by the end of the morning, Jeane had been admitted to the hospital and was being treated for pneumonia. We talked to Mom and the doctor later that afternoon, and they both gave us the idea that she wasn’t extremely sick. Larry says his mother agreed that it wouldn’t be necessary for us to go home. When I passed this news on to Shelly, she got very angry with us. It turns out you can’t ever know what people are really saying, and trying to say without speaking, when you are communicating by bad cell phone connection. We made an about-face and arranged to fly home on Wednesday. We spent Tuesday getting the boat into the marina and put to bed. This wasn’t quite as difficult as the hurricane preparation. Also, we just did this drill three months ago, so we were pretty good at it this time! Meanwhile, our new best friend, Pancho, agreed to pick us up early on Wednesday and take us directly to the local airport which is about 10 miles away. What a prince! We locked up the boat and gave a key to Pancho. About a week later, we asked him to go to the marina one night and open the boat for Leo. It turns out that Leo, Aquadesiac’s new crew member, had gotten a ride on a different boat that was heading back to Guaymas. They needed a key to that marina when they returned, and we just happened to have one. Pancho let him in and reported that all is well. Linda had just told us a story about a family that left their boat to go home for a family emergency. They were away for two years before they could return. Every single liquid or food in any kind of bottle, can, box, whatever, exploded. The mess was unimaginable. Thankfully, we will not have to worry about that! Mom is doing much better. She was in the hospital for five days, then rehab for five days. Now she is home and doing well. 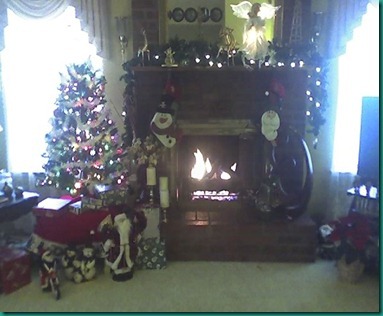 We put up Christmas decorations, and we are starting to feel a lot more cheery. 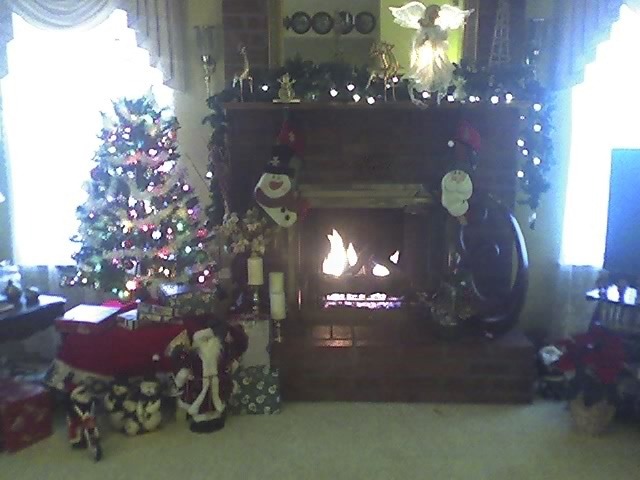 We will stay through Christmas since we are here. She still gets tired quickly. We had her annual Christmas party last Saturday. We were visited by a choir from MJC under the direction of Richard Colla. These singers were extraordinary, and everyone enjoyed it very much. Sadly, we received a phone call tonight from one of Jeane’s bowling buddies to tell us that one of the other bowlers passed away suddenly today. We were all together just yesterday for the Monday bowling league. The group always goes out to lunch together, and Toni was there with every one else. Arlene of Ubuntu (our boat buddy from last spring) just lost her own mother this week, too. All we know for sure is that our time here is short and precious. We hope that all of you are able to enjoy one more special holiday season with your family and friends. We send you our best wishes, and I promise to post again some time in January!